My mom, my dog and I trekked up to the Mt Hood National Forest yesterday. It was not raining, but the forest was very wet and the air damp. It could not have been more green and refreshing. We hiked along the Old Salmon River Trail, just a few miles from where I grew up. As we were checking out the river, my mom spotted this cool red mushroom. Neither of us had seen one like it before. The water had flooded the trail area the past week, and the mushroom had the residual sand caught in it. I have NEVER seen a red mushroom like this before! Amazing!! Great shot. First time I've seen this mushroom, thanks for sharing. What a great find! In spring and fall I look for mushrooms to photograph as I think they are photogenic. A great find, its color says "here I am" perfect for a macro shot or a Ruby shot. This is a spectacular capture. Really well done. Very nice photo - good looking cup fungus! 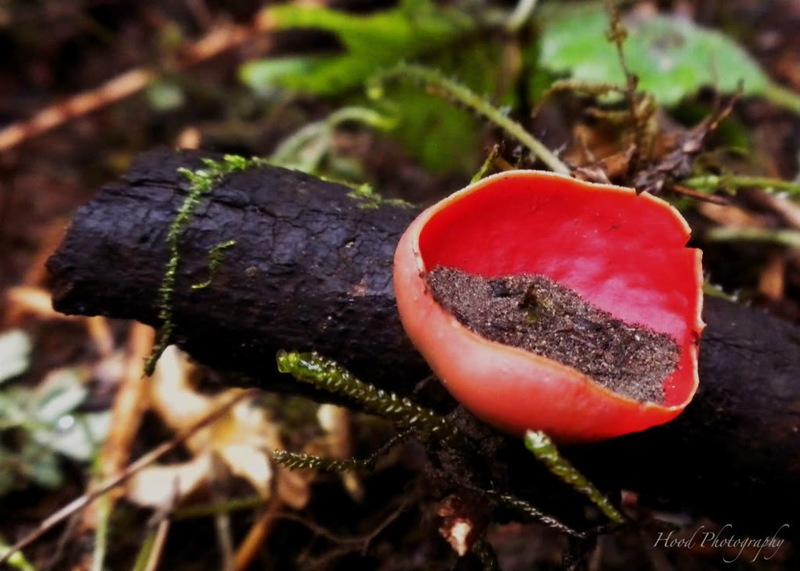 Might be Sarcoscypha coccinea (Scarlet Cup).